Manage life and work more efficiently. Best for those who want Office with Outlook on one PC. 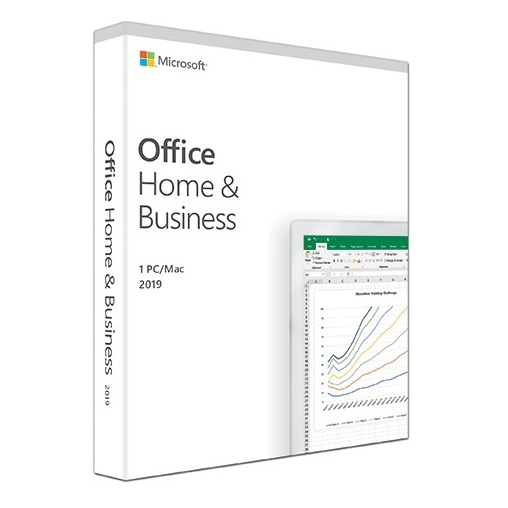 Office Home & Business 2019 is designed to help you create and communicate faster with time saving features, a new modern look, built-in collaboration tools, and the power of Outlook for email, calendars and contacts. Plus, you can save your documents in the cloud on OneDrive and access them from anywhere. • Graphics: Graphics hardware acceleration requires DirectX 9 or later, with WDDM 2.0 or higher for Windows 10 (or WDDM 1.3 or higher for Windows 10 Fall Creators Update). • Browser: The current version of Microsoft Edge, Internet Explorer, Chrome, or Firefox. Does Microsoft Office 2019 Home & Business come with a physical disc or does it need to be downloaded? There is no physical disc with Microsoft Office 2019 Home & Business. Inside the retail packaging will be instructions on where to download the software and your 25 digit product key card. What is the difference between Office 365 and Office 2019 suites? Office 2019 suites, including Office Home & Business, are available as a one-time purchase for use on a single PC. The applications are not automatically updated (to get the latest version, you must purchase Office again when the new version becomes available). Office 365 plans include the complete suite of Office software applications. Office 365 plans are available as 12 month subscriptions. With Office 365, upgrades are always included with your subscription. Is Internet access required for Office 2019 Home & Business? Internet access is required to install and activate Office 2019 Home & Business however the applications such as Word, Excel, PowerPoint & Outlook are fully installed on your computer and you do not need to be connected to the Internet to use them.